3rd Councilman: John Bryson Jr.
For thousands of years, the term "Quinault" referred to the people who made their homes within the watershed of the Quinault River. To the north live the Queets, Quileutes, Hohs and Makahs; and to the south lived the Copalis, Humptulips, Wishkah, Chinook, and Chehalis. When people from theses tribes and others moved to the Quinault Reservation they were considered to be members of the Quinault Tribe. Through its Constitution, which evolved over the course of a century, today's Quinault Nation recognizes the multi-tribal heritage of its people. Any individual who can verify at least one - quarter combined heritage from seven tribes (Quinault, Queets, Quileute, Hoh, Chehalis, Cowlitz, and Chinook) is entitled to be a member of the Quinault Nation so long as he or she is not a member of any other tribe. Individuals, who cannot qualify for membership on the basis of this "blood quantum" requirement, can apply for adoption into the Quinault Nation. Thus the term "Quinault" now refers to an individual who identifies with the Quinault Nation. On August 24, 1922 the Quinault people, for the first time, documented the shape and character of modern Quinault government in the BYLAWS of the Tribal Council of the Indians of the Quinault Indian Reservation. President Harry Shale and Agent W.B. Sam's signed the document into Quinault law. Under these Bylaws, the Quinault Indian Nation established an elective government ruled by the Tribal Council made up of voting members of the Nation and Business Committee made up of a President, Vice President, Secretary, Treasurer and seven councilmen (this was changed to 5 by amendment in 1934). Certain legislative powers were placed in the Tribal Council and certain legislative and executive powers were placed in the Business Committee. Over the next 43 years, the organic document of the Quinault government continued to evolve. 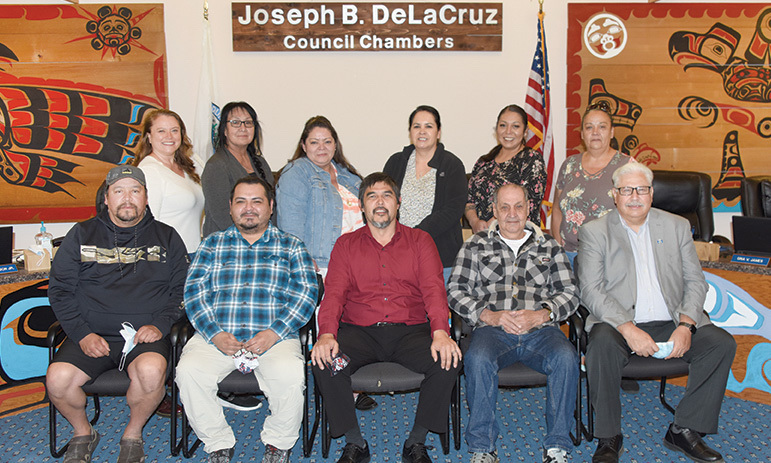 The Quinault Tribal Council formally ratified adjustments and amendments to its Bylaws and provided greater definition of the powers vested in Tribal Council and the business committee. President James Jackson and Secretary Frederick Saux Formally signed the new Bylaws on May 22, 1965.